Don’t forget to enter my million page views giveaway! A few weeks ago I shared with you a recipe for light brioche burger buns, and promised a future blog on a pork burger that was a perfect match for those buns. The inspiration for this recipe was a show by Giada de Laurentiis on FoodTV, but I made enough modifications to call it my own. Pork and green apples make a nice pas de deux, and to give the patties a little more spice I added a small amount of chorizo, an ingredient I’ve been using a lot lately. It packs so much flavor, but its heat is not overpowering, especially if you use it sparingly. These burgers were scary good. Scary in the sense that they almost gave me a heart attack. Read on, my friends. This post proves what I suspected for a long time. In a previous life, I was a merciless serial killer. Mix all the ingredients in a large bowl. Do not pack the mixture too tightly. Form into 6 medium-size patties. The mixture will be soft. 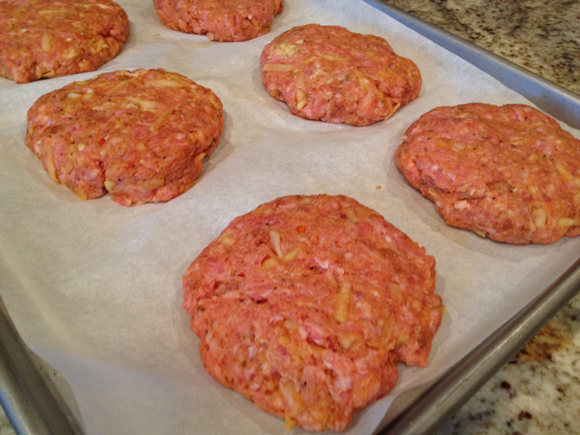 Place the patties over parchment paper and refrigerate until it’s time to grill them. Grill them about 5 minutes per side on grates lightly coated with oil. If you want to add a slice of cheese, do so on the final couple of minutes of grilling, or as soon as you remove them from the grill, keeping them tented with foil. Serve with tomatoes, lettuce, or any other topping you like. Comments: I prepared these burgers at the end of an intense working day. I was doing experiments that require very precise timing, and once started, cannot be paused until the very end. Every reagent has to be in its spot, ready to be quickly grabbed and used. Once the prep work is all done, I take a deep breath, start the chronometer, and hope for the best. It’s hard to have a totally flawless experiment, but that day the stars were perfectly aligned, and flawless it was. I drove home feeling on top of the world, ready to stretch the super-accurate timing to dinner preparation. Phil had to stay for another hour working in his office, so my plan was to welcome his arrival home with a nicely set dinner table, juicy pork burgers all ready. I made the patties, refrigerated them, worked on a couple of side dishes, and walked outside to light the grill. Under one of those gorgeous Kansas sunsets, I opened the knob of the gas tank, and lifted the lid of the grill to turn the flames on. The last thought that popped in my mind was “life is good”. And then, it quickly wasn’t anymore. Life had just gifted me a gargantuan mouse prancing over the grates. He froze when he saw me, and just as I let out a screech with the potential to wake up newborn babies in Tokyo, the creature jumped off passing one inch from my left arm, landed on the ground and disappeared into some bushes. Deja vu all over again. The worthless quadrupeds that I feed on a daily basis went hiding inside their dog house. Apparently they do not handle well hysterical screaming. I know, inconceivable. That marked the end of a perfectly timed meal. Instead of juicy burgers, Phil encountered a distraught wife who refused to step outside into the backyard to finish the dinner. Due to the profound psychological trauma this situation caused me, I was unable to use the grill for a couple of weeks. Now I go through a process of kicking the door that encloses the gas tank a couple of times, then banging on the grill lid four or five more times before opening it. I am sure the neighbors worry about my mental state in case they catch a glimpse of my routine. Granted, a foreigner can get away with a lot. For all they know, that might be a common pre-grilling performance back in Brazil. That’s my story, and I’m sticking to it. that happened to my neighbor but it was a rat laying in the ashes as she lifted the hood to light the grill. i should count myself lucky then…. a rat is a worse rodent to face. The burgers sound tasty though I’m not a big fan of pork burgers on the rare occasions that I’ve made them. I only bbq’d once this summer which I’m regretting. I really HAVE to make another batch of chorizo. It’s such yummy stuff. great job on making your own chorizo! one day I should go for that! I bet these are delicious, did have myself a little chuckle though about your experience. Knocking on the grill sounds like the right thing to do after that experience. It’s a form of karma. 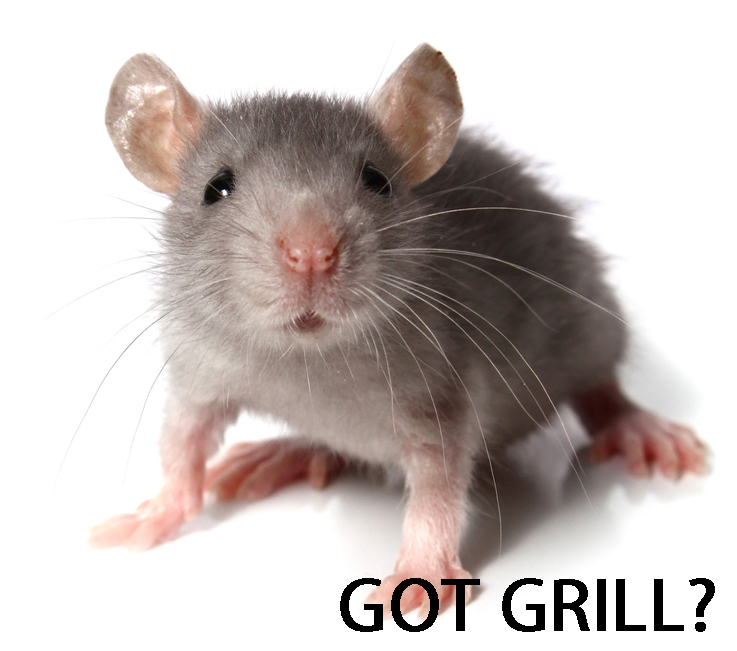 All that iron you have been depriving the E. Coli of is returning to you in the form of super mice in your kitchen and grill. This is one of the funniest blog posts I’ve read ANYWHERE. You totally crack me up, Sally! oh no, seems to me this has happened to you before… what’s that great buddhist saying… ‘nothing ever goes away until it teaches us what we need to know’ yup, even from a mouse! 😉 love it. dear universe: I have learned. can we be done with me and rodents exposure? Personally, I prefer porcine burgers to regular beef burgers. Your burgers look delicious. Hahaha! A VERY similar thing happened to me, but I’ll spare your readers the details These burgers look so good, I’d even open my grill again for them. And I need to get that bun recipe, too! definitely try the bun recipe, a real winner! Ooh! These look so good! Ryan and I don’t eat red meat, and we’re always looking for new burger ideas. These look heavenly! my sympathies. cockroaches were the reason I emigrated from Brazil, you know…..
OMG. My utter sympathies! When the damned rat was still around (we got it in the end with some poison pellets), I would stomp heavily on the steps before going down into the basement. And afraid it might be sleeping in the washing machine, i gingerly reached in and spun it many times before loading. Are you guys letting it go or have you got a rodent attack strategy? mise en place is indeed everything in this type of work. i love anything that requires precise timing, so those are by far my favorite type of experiments…..
Hahahahahaha, I would have paid a million $$$ to see you screaming at the mouse. 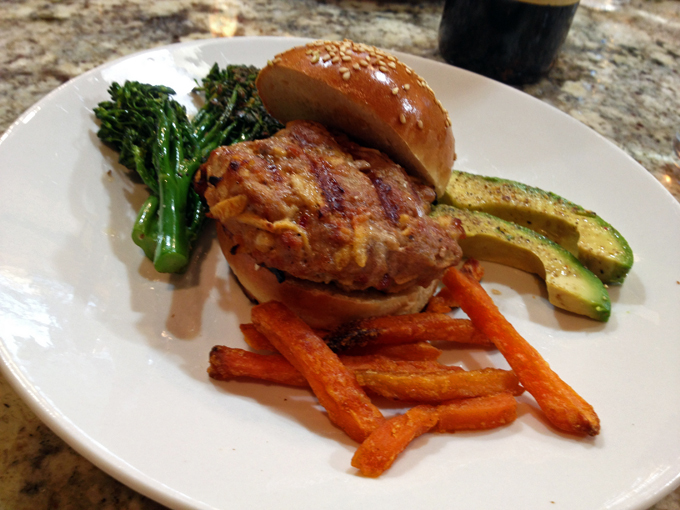 BTW loving that you added apples and chorizo to these pork burger, super tasty! i had to work with lab mice for years and was bitten three times by little nasty beasts called Black B57 mice. Tiny and very aggressive. i like to keep a safe distance from beasts that can jump in unexpected directions. A rat in the grill would mean the end of Sally. that does look scay good but not too scary to scare me away from eating it! YUM! Oh my gosh! I can just picture this scene. I can only imagine what the neighbors think. LOL. I would do the same thing! Darn little mice. We cleaned out some storage bins in the backyard recently and I swear there were spiders as big as tarantulas in there. I was screaming, shuddering, dancing about – I’m sure I looked quite off my rocker. Your pork sandwiches look very scary good – scary as in I could eat too many of those. Love that you used a bit of chorizo too. We would love this one! oh, huge spiders…. They are nasty, although my area oh expertise as far as scandals are concerned involves crickets and grasshoppers…. they tend to gang up on me, it is pathetic…..
Oh the crickets! We had giant ones in MN that would just randomly show up in the house. Our cats did seem to like those though, as I would just find legs left behind. Gross!!! What is about little critters that can invoke such fear in us? Those poor babies in Tokyo! Charlie doesn’t do mice either but I’d be happy to send over Lucy or Tallulah and they will make quick work of mousey.